I cleared this with BLUERAM, who cleared it with Fleetfang, so I'm good to post this up on here. 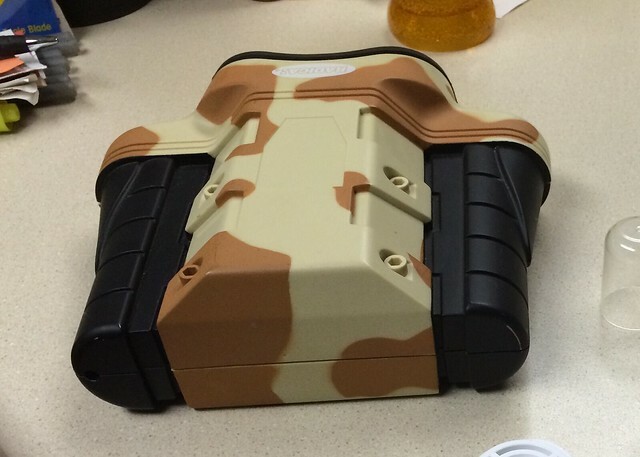 What I'm offering is a resin-cast replica of the Tank Assault handheld video game. I made the decision to make a mold of this after I was able to get my hands on an original that wasn't beat to death. I know how hard these are to find nowadays, and my intention in casting these was to not only offer a reasonably-priced version of the handheld, but to offer something that can really take a beating. We've all been there, and have all had things break at troops. My goal from the start was to offer something that hasn't been done before, and something that will not break the bank. This is also intended to be a direct replica of the handheld, in order to be as close to owning an original as possible. The handheld is to be molded without prior modification, with the exception being filled screw hold. it will be molded as a two-part mold, with a seam running along the original seam of the handheld in order to hide this as much as possible. In order to cast these to be as strong and structurally-sound as possible, they will be cast as a one solid, hollow piece. The reason for the castings being hollow is twofold: it reduces weight (every ounce counts), and it reduces resin used (keeps the cost down). The hollow cast also allows the end user the ability to drill through the piece in order to rivet straps, ring attachments, and clips directly to the body and to limit the amount of glued-on pieces. Since the only way to hollow cast is to have a hole somewhere in the mold, I will be leaving a hole where the clear piece of the visor normally is. The price per raw pull will be $35, shipped CONUS-only (If you will be at a troop I am attending and are okay with the wait, the price will be less shipping). My only acceptable payment option at this time is PayPal, with payment sent to bieda1010@yahoo.com (Tyler Bieda). I ask that no one send payment until I have cleared the order with you ahead of time.